First Donald Trump insulted North Korea's Kim Jong-un, then, hours later, said he hoped the two could be friends in the future. It is exactly the kind of contradiction that has typified his five-nation tour of Asia and left many observers scratching their heads. But what can we decipher about the US president's approach? Donald Trump is likely to return home and say he has had a great trip to Asia. There are some in the region who may agree that it has been of massive benefit, but not necessarily to America. 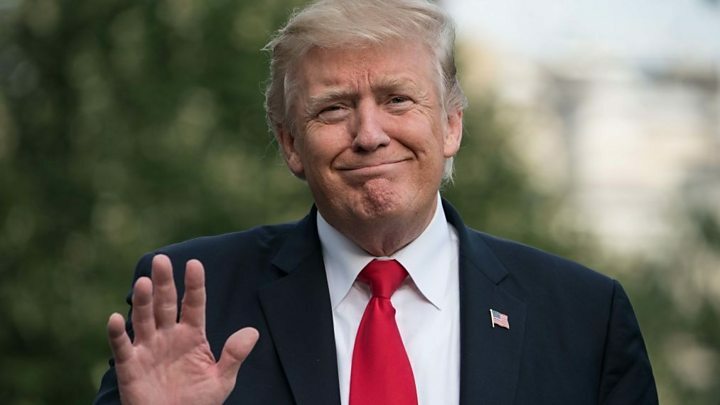 The US president has certainly been treated like a king everywhere he has gone, and it is obvious that he loves being feted and flattered - perhaps especially now, given all the criticism back home. In a foreign land, it is clear that if you treat him like royalty, he will behave like a polite guest. He has steered clear of nasty, uncomfortable things like human rights and democracy. Of course, we know that it does not take much for the statesmanlike conduct to fall away if the bear is poked. When North Korea taunted the US president, calling him again, as it has done in the past, a dotard, he could not help but react, suggesting Kim Jong-un was "short and fat". It may just be that the other leaders of this region are immaculate hosts, but there has been a strong sense during his trip that they have worked out not only how to avoid provoking him, but precisely how to disarm him: through flattery. Japanese Prime Minister Shinzo Abe said Donald Trump was his "favourite guy" to play golf with. South Korea's President Moon told the US president he was "already making America great", and at the National Assembly in Seoul he was introduced as "leader of the world". But after the splendour of his welcomes, he stood next to the Vietnamese president and did not talk about freedom of speech and the imprisonment of activists and bloggers. In Beijing, he stood next to President Xi Jinping without a single word of criticism. But his visit to China stands out to me as the most telling leg of this trip. It was the one place where things went a little differently for Mr Trump. Yes, there was an extraordinary welcome laid on for him, and pomp and ceremony that rivalled - even outdid - anywhere else. But it was not President Xi with gushing compliments about his guest, but the other way around. Mr Trump played a video of his granddaughter singing in Mandarin, he called Xi Jinping "a very special man" and told the Chinese president his "people were very proud of him". There was little in the way of personal praise that came back though. 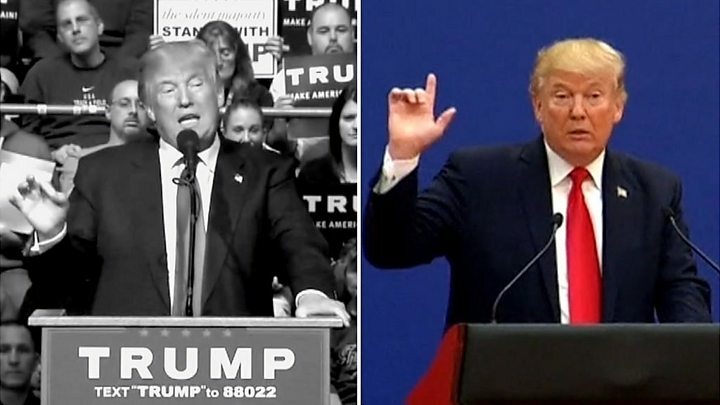 In Beijing, there was no chance of Donald Trump being called the "Leader of the World". Trump, China and Twitter - what's going on? 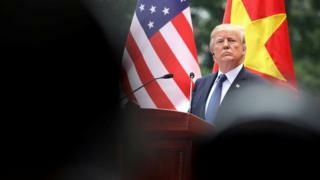 The US president may point to the next part of his trip, in Da Nang, Vietnam, when he was at his most vociferous, and say that that is where he told President Xi who was boss. At the Apec summit, without naming China specifically, he criticised those in the region who had engaged in unfair trading practices and said that America would no longer be taken advantage of. His speech was a stream of bombastic soundbites that will allow him to go back to the States and say he is following through on his vision of "America first". But what was fascinating was what followed. A little later, President Xi took to the same stage at the summit. He talked of the future, of innovation, technology, climate change and of a vision of the region moving forward together; in the past, the very talking points that might have been expected of a US president. That, perhaps, is the flaw of "America first". It may be a pragmatic, transactional approach to foreign policy. There is no time wasted on trying to impart American values, or improve societies. It is all about the deal. But that allows others to assume the leadership role, and for many in this region the concern is that that can only mean a more dominant, self-confident, even arrogant China. The kind observer might suggest Mr Trump understands that a publicly confrontational approach goes down badly with Beijing, but that behind the smiles tough talking is going on. Media captionWhat does Asia want from Donald Trump? Others may just find his approach perplexing - especially when it comes to his offer to mediate in the South China Sea dispute. Even though the US has taken no position in the row, it has insisted on the right to freedom of navigation in the face of Chinese displeasure. Strategically, there does not appear to be any circumstance under which the US would want China to militarily dominate this particular theatre. But is President Trump suggesting that compromise is possible? Or is it another example of Trump's America abandoning the country's traditional influence and priorities in this region? We do know that China cannot come close to matching the US in terms of military might. But is that fact enough to ensure that America retains its sphere of influence? Or is "America first", and indeed this tour of Asia, ushering in an era of "China stepping up"?